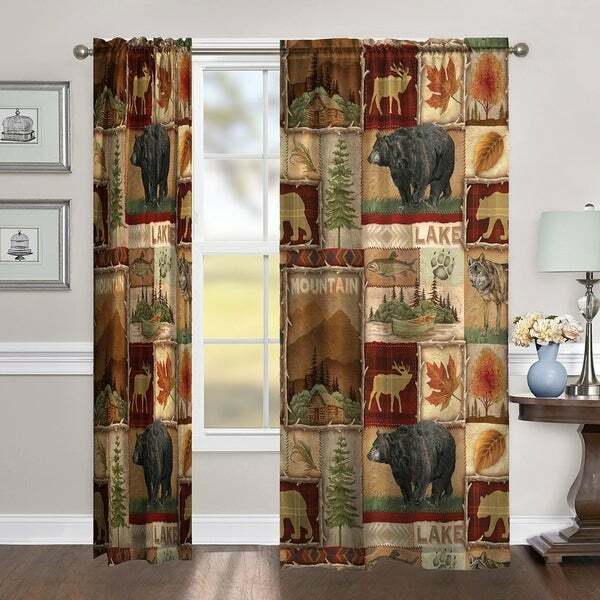 Laural Home Nature Collage 95 Inch Room Darkening Curtain Panel - 95l"x50w"
Laural Home Bear at the Lodge 84 Inch Room Darkening Curtain Panel - 84l"x50w"
Laural Home Nature Collage 84 Inch Room Darkening Curtain Panel - 84l"x50w"
Bring the great outdoors into your home with the fun patchwork design of Laural Home's "Nature collage" room darkening curtain panel. The rich earth tones of the playful, wilderness-themed imagery will complement and add warmth to any lake, lodge or cabin décor. Block unwanted sunlight while adding style and elegance to your home. Digitally printed to create crisp and vibrant images. Made of 100% polyester. 3" rod pocket (rod not included). Measures 95"X50". Panels sold individually. Machine washable. Dimensions 95.0 In. X 50.0 In. X 0.25 In.